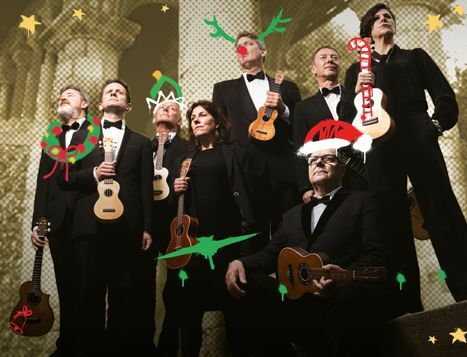 The original ukulele orchestra, the group that made the uke cool, the band who gave us uke mania invite you to join them in a bit of festive frivolity! This is definitely not shameless seasonal cashing in, just a little midwinter mischief and the chance to play or sing a-long with the odd well worn Christmas classic. From the North Pole to Sydney Opera House the Ukes tour planet Earth with their legendary live shows that plunder all genres of music from Wagner to Nirvana with wit and sheer plucking brilliance. Watch the tutorials online, learn the parts here and join in live! Wheelchair users and people with mobility issues are asked to call 01423 502116 to book. Running time; 2 hours and 10 minutes including interval and encore. People taking part in the performance will be allowed in with bags larger than A4. The bags will be searched for security. Otherwise you will not be admitted with any bag over A4 size. When booking online a £1.75 transaction fee will be added at the end of your order. Order from as many shows as you like at one time and pay only £1.75.